Posted on Mon, Feb 27, 2012 : 7:03 p.m.
A screenshot of the University of Michigan's NextGen Michigan website. University of Michigan students' school email will look a lot like their personal Gmail accounts next week. The school finalized an agreement with Google in October to transfer its email, calendar systems and other collaborative tools to the Google platform. The switch to Google —dubbed the NextGen Collaboration Project— is expected to create a more uniform, streamlined and collaborative communication system at U-M, said Bill Wrobleski, U-M director of infrastructure projects. "It's about collaboration," he said. "It's about how we can make our faculty and students more efficient in teaching, learning and research." Changing providers also is expected to reduce costs by roughly $750,000 annually. It's expected to cost about $1.8 million to initiate. 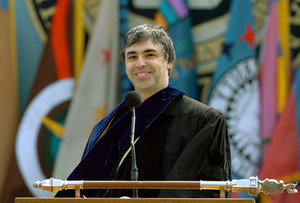 Google co-founder and 1995 U-M grad Larry Page gives a speech after receiving an honorary degree in 2009 from U-M President Mary Sue Coleman. The transfer will begin officially on March 5, when the entire university community, including health system employees, will get access to dozens of Google collaborative tools, including a Google Docs, a document program that allows all invited users to make and view word, spreadsheet and illustration documents. Students will switch to the new email system on that date, but U-M faculty and staff will switch to the new email and calendar system in May, June and July. Because of privacy laws, health system employees will continue using an internal email system. Students and staff can expect changes in the look and functionality of their email, although addresses will remain @umich.edu. U-M is switching roughly 80,000 accounts to the Google platform. The university has tutorial videos available for individuals who have difficulty using the new system. The NextGen Collaboration Project also will hold training labs for faculty and staff. "Whenever you change tools your biggest challege is getting people to know how to use the new tools," he said. "It takes time to get people up to speed." This month, the university tested the switch on about 1,500 accounts. The university has been able to largely automate the transfer process. Wrobleski said the switch has been largely received positively; however some employees have expressed concern about Google email privacy and others have been reluctant to switch from the Microsoft calendar and collaboration tools they currently use. "For some people this won't be their ideal choice," he said. "But when you're using Google tools daily, it's almost like an ecosystem of tools that go together and I think we're going to find that it changes how groups work together. "We're going to see some big changes," he continued. The deal has been in the works since 2010, when IT officials publicly acknowledged the need for a streamlined campus-wide online communication system and U-M’s IT Council endorsed Google over Microsoft. Both technology giants went head-to-head for a contract to replace more than 40 email and calendaring systems the university used. This story has been updated to reflect updated information on the health system email system. Kellie Woodhouse covers higher education for AnnArbor.com. Reach her at kelliewoodhouse@annarbor.com or 734-623-4602 and follow her on twitter. Wed, Feb 29, 2012 : 6:08 a.m. So if U of M is saving 750k every year after the next two, will tuition go down? I mean if they are transferring 80,000 email accounts to Google that means on average each user costs U of M over $9000 in administration, software, and hardware costs. I do wonder if they are not inflating those &quot;savings&quot; to put administration to Google Apps so IT can just sit back and let google handle backups, software updates, and load balancing. Google docs AND gmail have already been hacked multiple times with cross site request forgeries and XSS so this means that now not only are UofM students putting their security in Google's hands, they are PAYING for it? Haha. I do not understand why IT professionals are in such a hurry to outsource everything. In this case, the emails aren't even being stored in the USA. Tue, Feb 28, 2012 : 7:40 p.m.
Tue, Feb 28, 2012 : 5:18 p.m.
As a long-retired former member of the U. of M.. University Wide Computing Policy Committee, I see this development as one more step in the abandonment of control over its systems to commercial interests. I remember when IBM came to the U. of M. requesting that they help them design and create a timesharing operating system for their IBM360 archetecture. Now we see corporations and outside influences controlling everything. I've been a long-time user/evaluator of Google's huge complex of fragments of open source software and I can say unequivocally that there will be glitches in the process going forward. An awful lot of the ballyhoo and nonsense over Security occurs either because a vendor out there stands to gain something or because of massive functional illiteracy on the part of consumers and administrators/implementors of software which leads to poorly designed products and end-user failures in discipline which compromise perportedly secure data. By moving data from local servers to &quot;the cloud&quot; certain efficiencies are possible, but new issues also emerge, for example, the one cited in this article, namely that data could be &quot;hosted&quot; anywhere. It would seem to me that a customer as big as U. of M. could cut a deal with Google to keep all U. of M. data/traffic hosted on local servers, something whicu would simplify the task of performance monitoring and network management at the U.
Tue, Feb 28, 2012 : 9:29 p.m.
UM tried to sway Google on keeping data in the US but Google answered with a resounding &quot;No&quot; instead. UM in turn spun that to say if Google ever does allow that feature UM will be toward the front of the line. Tue, Feb 28, 2012 : 4:03 p.m.
Tue, Feb 28, 2012 : 12:26 p.m. The fact that Google can't meet regulatory privacy and storage requirements says a lot. The fact that the medical organization is maintaining Microsoft Exchange servers and software to maintain privacy requirements says it all. Tue, Feb 28, 2012 : 11:57 a.m.
Tue, Feb 28, 2012 : 11:21 a.m.
Yea, but who really, really wants Google to have access to ALL of their private E-mails, and attachments, now all wrapped up in a box with a bow for Google to data mine? Tue, Feb 28, 2012 : 10:13 p.m.
Tue, Feb 28, 2012 : 4:11 a.m.
Tue, Feb 28, 2012 : 2:58 a.m.
Tue, Feb 28, 2012 : 2:45 a.m. The big question to me is privacy: in view of Google's new policies on browsing (it will compile records of all searches, etc.) what are the guarantees that it will not be compiling data on UM users? What are the advantages of Google mail and calendars for those who use the Mac applications for these functions? Tue, Feb 28, 2012 : 1:52 a.m. So the U is subsidizing its infrastructure with advertising? They should consider ads in the classrooms. What happens if an engineer at Google is trying to get his kid in and peeks? Tue, Feb 28, 2012 : 5:15 p.m.
Nope. No advertising at all. Tue, Feb 28, 2012 : 4:05 p.m.
Tue, Feb 28, 2012 : 11:26 a.m.
Oh, you have it wrong, what will happen is this engineer, if smart, will read the PRIVATE admissions E-mails for a couple years in advance and see how to game the system, learn all that he or she can, and then have his or her child adjust his or her essay and other things that make the Michigan difference so the odds are increased. Tue, Feb 28, 2012 : 1:15 a.m. It should also be noted that this is not a &quot;streamlined campus-wide online communication system.&quot; Some units may be brought together by this but many units that weren't split across multiple collaboration tools before will be now due to regulatory compliance. Left out of this article is the fact Microsoft Exchange will still be maintained on campus largely to deal with the regulatory issues, so it's hardly a &quot;streamlined campus-wide online communication system.&quot; Research involving HIPAA and export restrictions cannot be stored in GMail due to a lack of compliance, largely due to Google not promising to keep UM's data on US soil. The cost savings are definite but lets not romanticize UM becoming an entity of pure revolutionary collaboration under Google. Tue, Feb 28, 2012 : 1:01 a.m. I've heard of problems with rate limiting. What good is a 25GB mailbox if you can't synchronize it at a reasonable speed? Wasn't UM supposed to get some fancy special treatment from Google? If you actually compare the original service level agreement with the &quot;revised&quot; one you'll notice very few differences, and not many that are actually anything of consequence. Data is still stored off of US soil. Whatever happened to ADA compliance with Google Apps? Wasn't that another big sticking point with UM? Regulatory compliance is still a major issue. Preliminary reports do not look promising. I am glad to hear someone's saving money somewhere! Tue, Feb 28, 2012 : 4:13 a.m.
Tue, Feb 28, 2012 : 2:42 a.m.
John, that was their intent but it simply did not happen. Google only offers that in Google Apps for Government and UM could not sway Google on this. The Google Agreement UM signed used to be on the NextGen site. UM made the decision to retain Microsoft Exchange internally to deal with export compliance issues. Tue, Feb 28, 2012 : 1:32 a.m.
One of the conditions for signing on with Google was their assurance that all data would be housed in U.S. data centers. Whether such a thing can be proven or confirmed remains to be seen. Tue, Feb 28, 2012 : 12:46 a.m. I recently switched from Firefox to Google Chrome, and so far it's been working very well - and it's a lot less cluttered. Firefox of old was a vast improvement over MS Internet Explorer, but then they started updating every other week (or so it seemed) and with each update it became slower and slower and unsupported utilities increased - the last update was one update too many for me. Tue, Feb 28, 2012 : 5:46 a.m.
im on Firefox 3.6 and have been for awhile...every time i upgrade above that Firefox loses some functionality.